Julie Sahni’s Indian Cooking School is rated as one of the best in the United States, and her cookbooks have shown many a novice the path to Indian cooking. 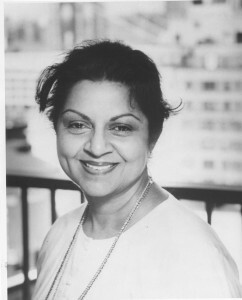 She is the author of a number of cookbooks, and we used her Classic Indian Cooking for this month’s menu. The India that she grew up in was a kaleidoscope of cities and small towns. Julie’s father was a scientist with the defense department, so Julie’s childhood was spent in many different cities. She got to embrace many cultures apart from her southern Indian identity, and was not brought up very traditionally. Sahni is the second of four daughters, all brought up to be high achievers. Julie herself not only became a noted Bharata Natyam dancer, but she also earned a degree in architecture in the 1960’s when there were only five females in her class at the School of Architecture in Delhi. As a child, she had learned cooking at an Arya Samaj school, and, much later, her project in architecture was on kitchen design in hotels. As she recalls, “Food was always coming into play.” Her deep interest led her to take a butcher’s course, as well as classes in Chinese, French, and Italian cuisine. Some of her fellow students asked her to teach them karahi cooking, and so started her classes in her home. After the birth of her son, Julie decided to make the cooking classes a full time career simply because of the flexibility it allowed her. Sahni’s passion for India and its cuisine comes through in all that she does. She’s been a speaker at the Smithsonian, Asia Society, and the National Geographic Society, as well as a teacher at many cooking seminars. Part food historian, part chef, part teacher, and part raconteur, for Julie Sahni the greatest joy is in winning new converts to India’s superb culinary traditions and culture. Indians culture teaches that food tastes so much more delicious when it’s shared with others. We hope you think so, too!